WCI is pleased to introduce its newest staff member: Dale Umlauf, vice president-business development. Dale comes to WCI with a strong background in business development and banking. 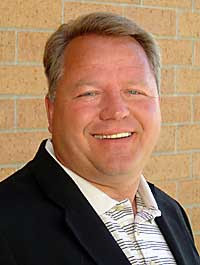 Most recently he served as the Crookston Development Authority executive director in Crookston, Minn. Previously he was the Small Business Development Center director in Bemidji for three years. He has 20 years of banking experience. Umlauf received the Bachelor of Science degree in business administration with concentrations in finance and economics from Bemidji State University in 1981. He has a daughter who lives and works in Minneapolis, and a son who will be attending NDSU in Fargo this fall. Umlauf will be making his home in Fergus Falls.